This brand-new 9th edition of the Bosch Automotive Handbook is in stock now. The first edition of the Bosch Automotive Handbook, was published in 1932, and this new and revised 9th edition follows on those same footsteps, almost 80 years later. After a long hiatus, this popular pocket guide is now back in stock and available once again here at The Motor Bookstore. The Bosch guide is an indispensable automotive reference source, packed with precise automotive technology information, making it the perfect reference handbook for academic, personal and professional use. 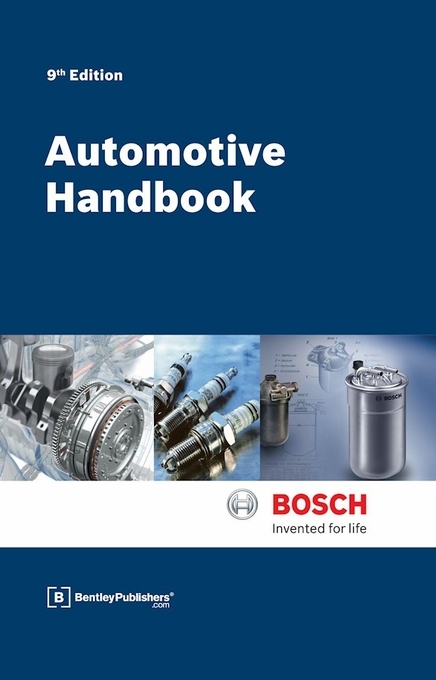 The Bosch Automotive Handbook 9th edition covers a wide range of topics from basic principles of automotive engineering to chassis systems, active safety, lighting equipment and more. The comprehensive handbook is a great resource material for automotive engineers, mechanics and more. The book is easy-to-use and includes carefully planned sections with in-depth coverage of select topics. The Bosch handbook ships for free to the continental 48 states. Internal-combustion engines are classified as thermal engines. The essential feature of a thermal engine is cycle direction, which is characterized by the output of work. Contrasting with thermal engines are heat pumps, also called refrigerating machines, which are characterized by cycle direction in the opposite direction and require drive power in order to operate. The operating principle of thermal engines is always the same. A working medium is compressed, whereupon energy is supplied while the medium is compressed with a corresponding further increase in pressure. This is followed by an expansion with power output. In open cycles the working medium which has performed the work is discharged. In closed cycles the initial state must be re-established by cooling the working medium before compression is restarted in open and closed cycles. Many thermal engines are characterized by an energy input resulting from a combustion process (Table 1). During combustion the energy chemically bound in the fuel is supplied as reaction heat to the cycle. Here compounds containing carbon and hydrogen oxidize with oxygen, which is why typically ambient air with approximately 21% volume of oxygen makes up a significant part of the working medium. The rise in the sheer amount of electronics in the vehicle, the use of software to control the vehicle, and the increased complexity of modern fuel-injection systems place high demands on the diagnostic concept, monitoring during vehicle operation (on-board diagnostics), and workshop diagnostics. The workshop diagnostics is based on a prompted troubleshooting procedure that links the many possibilities of on-board and off-board test procedures and test equipment. As emission-control legislation becomes more and more stringent and continuous monitoring in driving mode is now called for, lawmakers have now acknowledged on-board diagnostics as an aid to monitoring exhaust-gas emissions, and have produced manufacturer-independent standardization. This additional system is termed the OBD system (On-Board Diagnostic system). Monitoring algorithms check input and output signals during vehicle operation, and check the entire system and all the relevant functions for malfunctions and disturbances. Any errors or faults detected are stored in the control-unit fault memory. When the vehicle is serviced in the dealer's workshop, the stored information is exported over a serial interface. This allows troubleshooting and repairs to be carried out quickly and reliably. Antilock braking systems (ABS) are braking-system closed-loop control devices which prevent wheel lock when braking and, as a result, retain the vehicle's steerability and stability. In general, they also shorten braking distances compared with braking scenarios when the wheels lock completely. This is particularly the case on wet roads. The reduction in braking distance may be 10% or several times this figure, depending on how wet the conditions are and the road/tire friction coefficient. Under certain, very specific road surface conditions, braking distances may be longer, but the vehicle still retains vehicle stability and steerability. The requirements placed on an ABS system are described in the regulations ECE-R13(1). This regulation defines ABS as a component of a service-brake system (Figure 1) which automatically controls wheel slip in the direction of wheel rotation on one or more wheels when braked. ECE-R13 Annex 13 defines three categories. The present generation of ABS meets the highest level of requirements (Category 1). Robert Bosch GmbH is the world's largest automotive supplier. The large number of applications for patents and utility models is impressive proof of the company's leading position in automotive engineering. 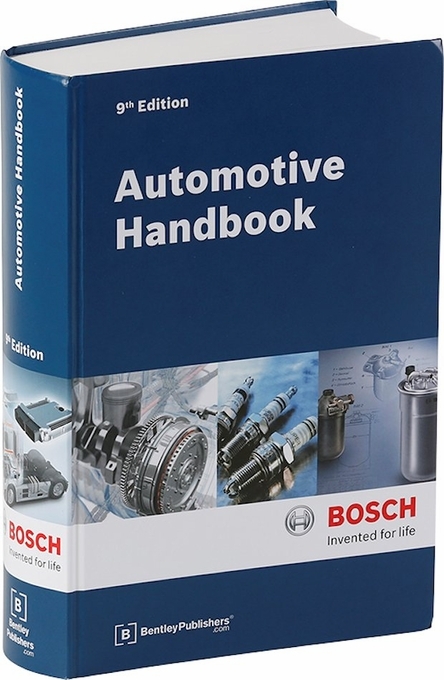 Ask a question about Bosch Automotive Handbook 9th Edition. Complete and thorough, based upon my 40+ years of automotive background. A real gem of a book for anyone interested in detailed automotive theory.